AUCTION CLOSING DATE: December 12, beginning at 6:00 pm. Bidding closes the first item at 6:00 pm EST, then closes 5 items per minute thereafter to the last item in catalog order. SHIPPING: Shipping available for small to medium sized items. To be handled solely by The Packaging Store of Roanoke,VA. 540-772-0999. Auction Company will deliver items to the shipper or shipper will pick up items. Shipper will contact the buyer concerning rates. 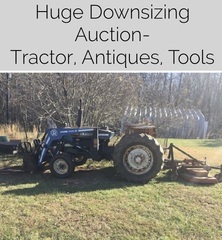 Please email us at jarrod@farmerauctions.com or call 540-384-0100 to notify us that you would like to have your items shipped. CHOOSE WISELY: If you bid on the wrong item or decide an item is not suited for your intended use, our clients will not assume the cost of your mistakes. You agree that your failure to inspect or otherwise become fully informed about the items offered for sale in this auction will not be grounds for a refusal to pay amounts due to the Auctioneer nor for any claim against the Auctioneer. 22. Claims and Choice of Venue: Any claim or controversy out of or relating to these Terms and Conditions, or to any breach thereof, will be settled either (1) in Pulaski County, Virginia’s Small Claims Court, if the claim in question amounts to less than $5,000, or (2) by means of arbitration in accordance with the Commercial Arbitration Rules of the American Arbitration Association, if the claim in question amounts to more than $5,000. In the event of arbitration, judgments upon the award rendered by the arbitrator may be entered by any court having jurisdiction. You agree that all claims will be litigated or arbitrated on an individual basis, and will not be consolidated with any claim made by another party. Venue in every case will be the City of Salem, Virginia. You agree that any judgments awarded may be applied to and collected from you personally or corporately. Should any party file an action contrary to this paragraph, the counterparty may recover reasonable legal fees and costs. Further, if you bring a claim against the Auctioneer and do not prevail, you agree that you will reimburse the Auctioneer for all reasonable legal fees and costs.